I live in a hot, dry region, but it isn't what you would call a desert area. I need to water plants regularly here and usually give my perennials and shrubs about an inch of water a week. However, I'm getting interested in xeriscape and just ordered some of your drought-resistant plants, including Cedros Island Sage, Giant Purple Desert Sage, Orchid Glow Sage and Hairy Sage. How should I water these desert plants? When growing desert plants, matters to consider include: quantity, duration and timing of watering; soil drainage, which should be excellent; and types of native lands from which the plants come. Desert lands vary from sandy expanses, such as Death Valley in California's Mohave Desert to dusty shrublands in the Southwestern Texas portion of the Chihuahua Desert. There are also microclimates within those areas. For example, some desert plants, such as Mountain Sage (Salvia microphylla spp. such as Orchid Glow Sage) are often sheltered part of the day by shade in canyons while other plants are exposed to full sun and heat all day. So lots of variety exists among plants native to these regions, including different preferences for water consumption. One common gardening practice in more humid areas that is wrong for all desert plants is frequent, shallow watering to keep soil moist. One rule of thumb is to let soil for desert species dry out between waterings. So watering should be infrequent. It should also be a sufficient soak to help the plants develop the deep and extensive root systems that let them survive drought. Tools such as trowels, pencils, screwdrivers and metal rods aid in testing for depth and duration of watering. Salvia Small Talk: How to Determine Soil Moisture Level suggests techniques for using these objects. Observation is another key factor in determining sufficiency of watering. If you see plants wilting during heat or losing leaves, it's time for more water. Keep in mind that yellowing leaves may be a sign of either too little or too much water. If you are watering certain plants more than once a week, overwatering is often the culprit. Another crucial rule -- one that should be followed with most plants during summer heat -- is to water early or late in the day when temperatures are cooler. Irrigating at peak temperatures causes water loss from evaporation and also may cause roots either to cook or to be vulnerable to fungi that love water and heat. Avoid overhead watering late in the day, because that can lead to fungal growth, such as mildew, during cooler night temperatures. In areas with hot temperatures during the growing season, drip irrigation can help to avoid this problem as well as evaporation loss. Mineral mulches, such as gravel or pebbles, are useful in conserving moisture without creating fungal growth. You mention giving your garden an inch of water a week, but don't say whether you are providing this all at once or in spurts throughout the week. One definition of deep watering is to give a plant enough water over enough minutes in one watering that the moisture reaches its deepest roots. Salvia Small Talk: Deep Watering vs. Sprinkling provides more information about the necessity of deep watering. The process highlighted in another article, Salvia Small Talk: What Is an Inch of Water? can help you to measure the amount of water you provide. Regardless of how much water any desert plant requires, all need good soil drainage. Regularly subjecting arid and semi-arid Salvias to more water than they are accustomed to in their native environments can harm them. The first two plants you mentioned -- Cedros Island Sage (S. cedrosensis) and Giant Purple Desert Sage (S. pachyphylla 'Blue Flame') -- are native to harsh desert environments. When first planted, they may survive an inch of water a week if they are planted in sandy soil with sharp drainage. But once established they need much less frequent deep watering. While a well-established Hairy Sage (S. villosa) can handle regular deep irrigation, it should be watered less frequently than Orchid Glow Sage (S.'Orchid Glow'). Cedros Island Sage is an evergreen perennial groundcover, whereas the other species are either shrubs or subshrubs -- plants that combine woodiness and soft herbaceous growth. We are hesitant about suggesting a definite watering schedule for desert plants, whether perennials or shrubs, because schedule depends so much on local conditions. Not all of our customers who purchase desert plants live in arid regions. However, we agree with the Phoenix, Arizona, Desert Botanical Garden (DBG) that all plants require more water when young or newly transplanted than when older and well established. Depending on seasonal rainfall, DBG says that when newly planted, desert species need deep watering once a week when temperatures are over 100 degrees F. DBG increases that figure to twice a week for small plants, such as those in 1-gallon containers. DBG also notes that the length of time between watering increases for desert plants as years pass. 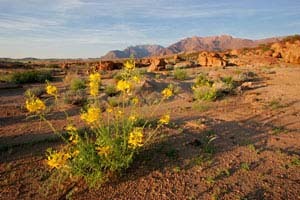 It says that after two years in place, an extremely drought-tolerant plant (S. pachyphylla spp. fit the bill), would need deep watering about once every two weeks in heat over 100 degrees. Watering frequency decreases as temperatures go down. By the time temperatures in a dry environment reach 75 to 90 degrees F, DBG says, a well-established desert plant may need watering only once every four to five weeks. Similar to cooking and baking, landscape watering isn't a precise science. You need to toss in a heaping handful of observation to get the recipe right. Please contact us at FBTS if you have more questions about cultivating a beautiful, drought-resistant garden.